109 posts tagged with statistics. Who are the answeringest mefites? After many years of service, jaden is no longer be maintaining his wonderful Mefi Contribution index. Results will now be frozen at mid-August. Thanks for running it for as long as you did, jaden! How much use does MeFi Jobs get? As a follow up to this post on Lucia De Berk: she has (finally) had her conviction overturned, a conviction based in part on bad statistics. Ben Goldacre's follow-up summarises the case and also features two of the opposing expert witnesses going at it in the comments. How many countries are represented on Metafilter? No mentions across the site? Really? Has no one heard of this before? The side-discussion about Macs here has made me curious about the % of mac users here as indicated by the mefi.com server logs. Can I get some user agent statistics? Which post has been the most "removed from favorites"? I don't think this is answerable from the data dump. What do you say to near real-time traffic stats? Metafilter Infodump: more stats than you can shake a stick at. Fingers in the great anonymous dyke? I'm an avid reader of Puke & Cry's Deleted Thread blog, and it got me wondering: Do any of the admins have stats on the most posts deleted in one day? Or, the most doubles (i.e. the most posts on one topic that were deleted - I'm guessing it must be an obituary post, maybe James Brown)? Or, the longest time span without a deletion? Etc. I know MetaFilter isn't a popularity contest, but just in case, I thought it'd be interesting to gather some stats on what percentage of certain users' posts/comments are favorited. Here is a completely unscientific sample. Fantasy feature: hover over "x users marked this as a favorite" and see the names of the people who did the favorite marking. Whaddaya think? I was wondering how feasible a few adds on for people who post threads would be. I was thinking would it be possible for the OP to be able to see stats like how many people viewed the full thread and how many clicked on the different links? it would give a fairly good idea of how much interest a post generated, over and above what you can see from the number of favourites, etc. It'd be kind of awesome if we could see, in some generic way like "hits", how many looks our MeJobs job postings have gotten. Since apparently MeFi users want a way to rank each other, here's an easy way to do it. You take one of your posts, and a tag from that post. Then, you find out how many google hits the tag generates vs. the number of times it is used as a tag in MetaFilter. The winner is the person who has the highest google-hit to MeFi tag ratio. Just a casual observation, but it looks like AskMe's post count will reach parity with MeFi's somewhere in the next 24-48 hours. By the end of the week there will be more threads created on the green than created in the blue. What's the percentage of MeFites who have no one nearby? I just moved away from Vancouver (in the interior, Quesnel, to operate my hosting/computer services biz where I actually WANT to live) and suddenly, after updating my long. and lat., I'm all alone! Matt, can I have a pony for Christmas? Nothing too fancy, just some public statistics. Boingboing, for example, uses AWStats, which provides a delicious smörgåsbord of information. It doesn't sound too difficult to use, I've set up similar things on sites of my own. Is there a ranking somewhere of who has had the most comments or posts favorited? What percentage of mefites actually contribute to metatalk? And how popular is ask.me in comparison to the blue? Ever wondered which sites Metafilter users link to the most? Ever wondered which sites Metafilter users link to the most? I've updated Metafilter Sources for the first time in two years, showing that Youtube and Flickr are now in the top 20, and that Wikipedia is now the most popular external source ever. Move over, Newsfilter... It's Wikifilter time! 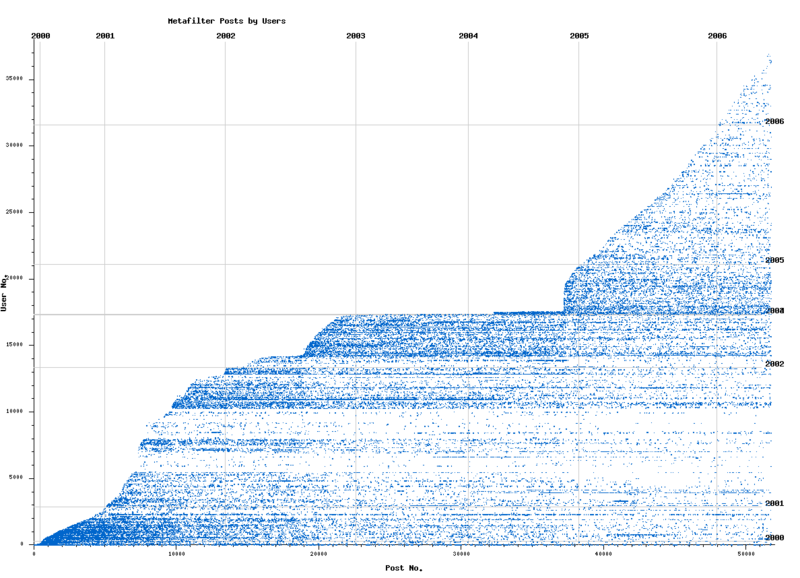 Also, I updated the Metafilter Stats charts through June 2006. More analysis inside. 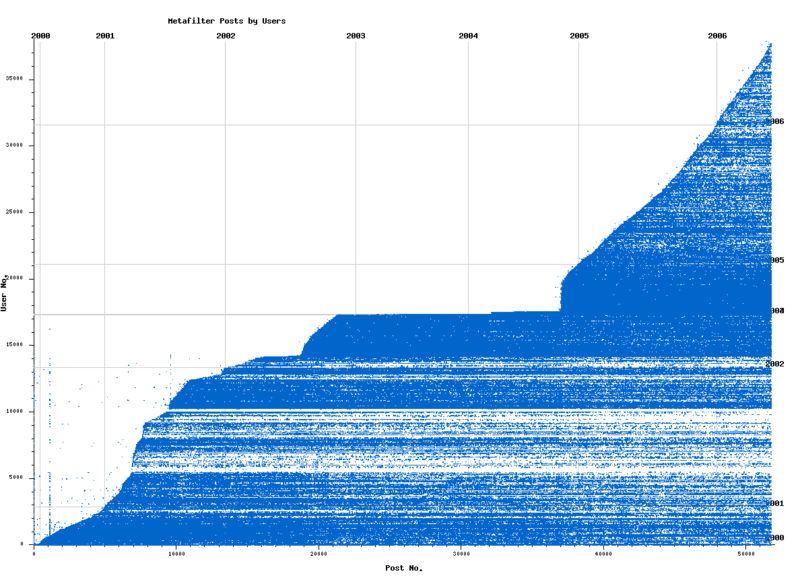 Here are two charts about metafilter. Posts and user numbers and comments and user numbers. Each dot represents a post (or comment), with the post number and number of the user who posted (or commented) as the xy data. I don't remember what prompted me to make these (some metatalk thread, I'm sure), but I found them again on my hard drive and thought someone else might find them interesting (I brought them back up to date, too). There are half a dozen interesting little milestones that show up in the graphs, more than I could see probably.